One of the cool aspects of not planning on where to go for date night is finding fun places at the last minute. 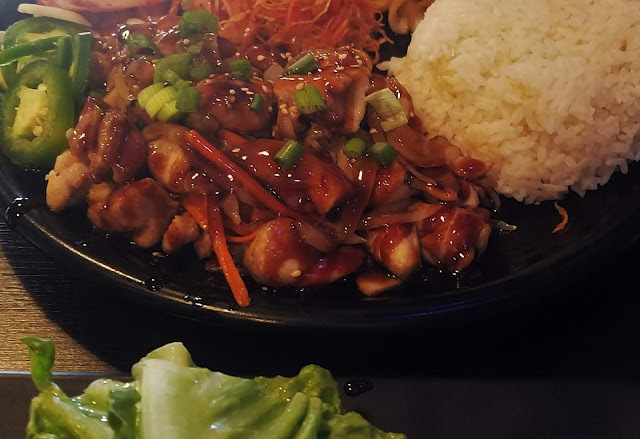 We knew that we wanted Korean food. Azit Pub was a random find because we happened to find parking in front of it. Azit is a Soju Bang or Korean soju room. It is a drinking place popular among Korean-American twenty-somethings/thirty-somethings. As the name implies the drink of choice is soju-based cocktails. Korean pub food such as the famous crunchy Korean fried chicken, kimchi fried rice, corn and cheese, grilled meats, etc. accompany the drinks. Everything is palate-numbing spicy, double even triple fried and swimming in sweet and fiery sauces. Soju Bangs come alive when it gets dark. That is when the party gets going. Blaring K-pop music will shatter your eardrums. Beware of flying bottles and you might get showered with beer or soju. At least that was our experience at another Soju Bang a while back. Our server was nice enough to warn me and Mr Sweetie that a group that was celebrating a birthday was about to make it rain with beer. It was at the awkward hour of 5 pm when Mr Sweetie and I went to Azit. The place was super-bright with the sun filtering through. (Making my pictures overexposed. Boo!) We decided to go in because it has been a while since we have had this type of modern interpretation of Korean cuisine. 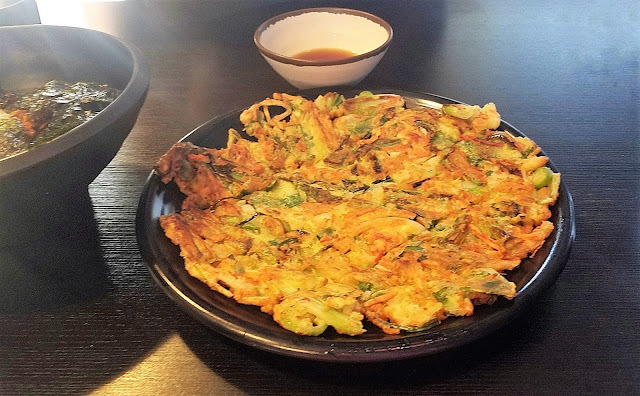 We readily went for Kimchi pancake $10 which is our go-to appetizer when at a Korean restaurant. It was delicious. 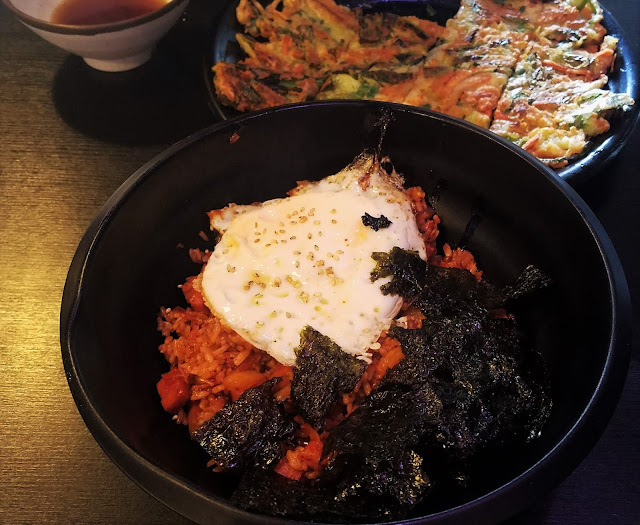 I had Kimchi Rice topped with fried egg and seaweed $9 for my main meal. It was like rice on steroids because it was also loaded with cubed pieces of spam mixed in with the rice. Since I hardly eat cured meats, I picked out most of it. It was still very tasty even without the added spam. It was a meal in itself. 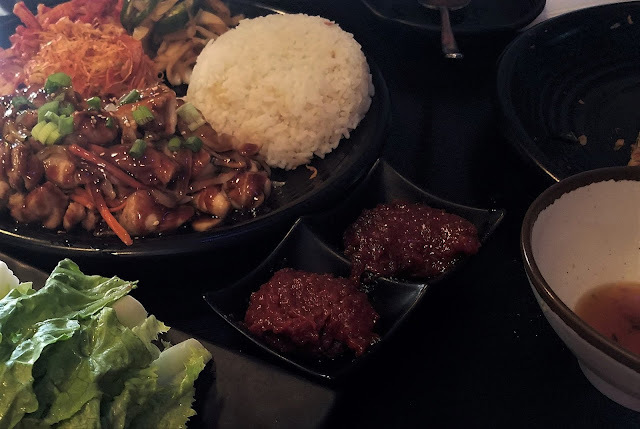 Mr Sweetie ordered an Oven Teriyaki Chicken SSAM Dosirak $18. It was served with vegetables, kimchi, and jalapenos pickle. 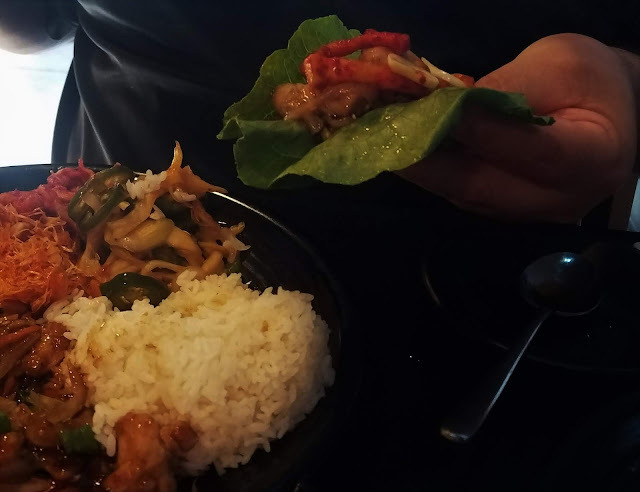 A lettuce was served on the side so you can spoon on your rice, meat and veggies and eat it like a taco except with a lettuce leaf instead of tortilla. Mr Sweetie sneaked in an order of Kimchi Cheese Fries $11. It looked very good but I was proud of myself for resisting. Mr Sweetie's eyes were bigger than his stomach (as always!). We ended up taking it to go. 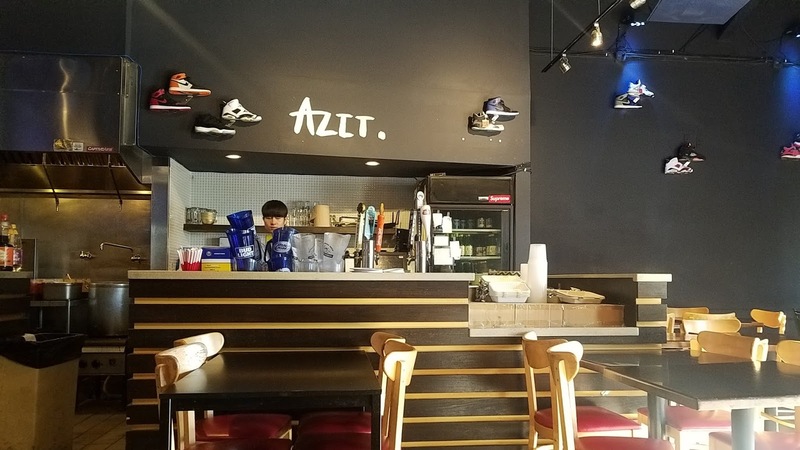 Azit is a fun place to experience this type of traditional dining. The owners (we assume as the ones working there) are young and passionate about the cuisine and business. The Nike shoes on the wall reflect the playful spirit of the proprietors which translate into the delicious food and attentive service. As I can fairly say "been there done that," I can skip the party atmosphere and just enjoy the food. Maybe next time I will even order a soju. I will let you know how it goes when I do. Travel and Dining Tip: North Oakland has plenty of Korean eateries. Korean row stretches from 40th Street to 51st Street and Telegraph Avenue in the Temescal neighborhood. Korean restaurants are right next to each other. We have gone to almost every one of them, and every single one is good. We are so lucky to live in this vibrant and fun neighborhood. If you want to know which ones are our favorites, just drop me a note.